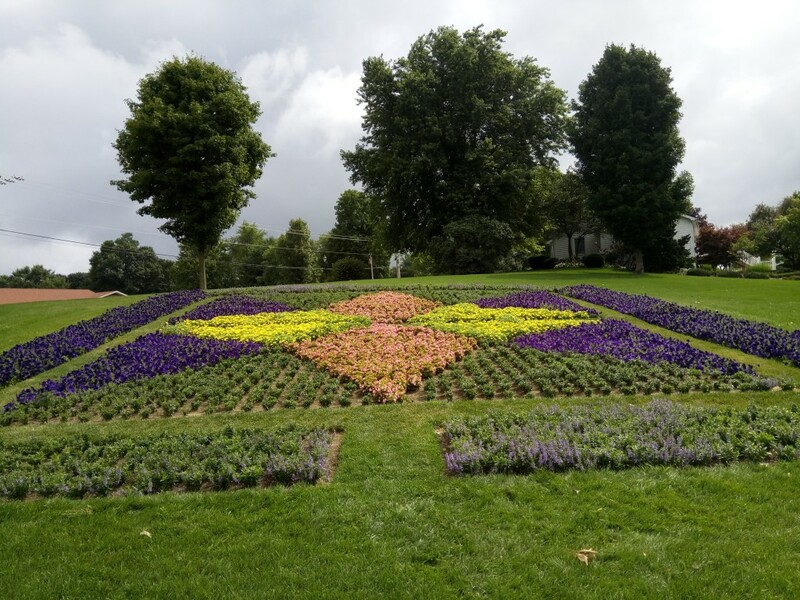 We recently visited the Quilt Gardens, a really fun ongoing garden tour in the Elkhart Indiana region. Volunteer gardeners from that area installed more than a million plants in eighteen gardens. 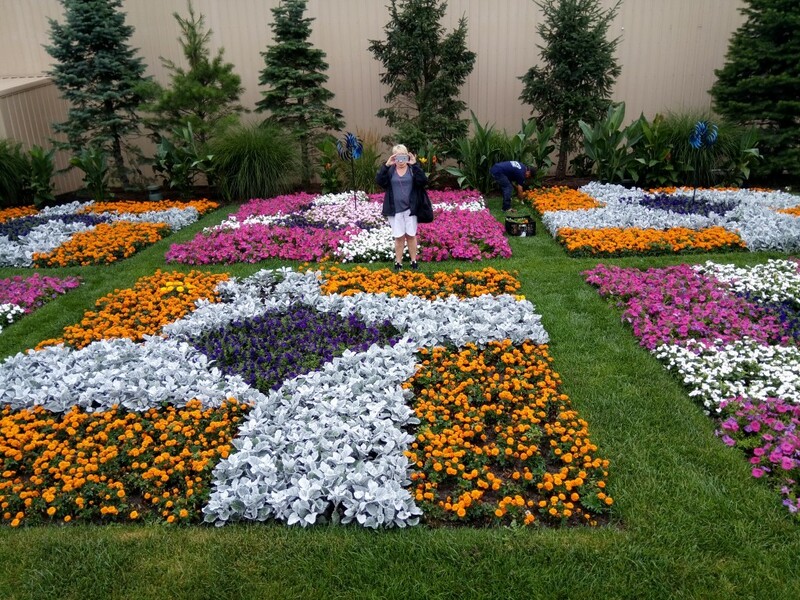 Flowers and colorful foliage plants are arranged to reproduce quilt patterns on a large scale. Vibrant flowers reproduce quilt patterns. 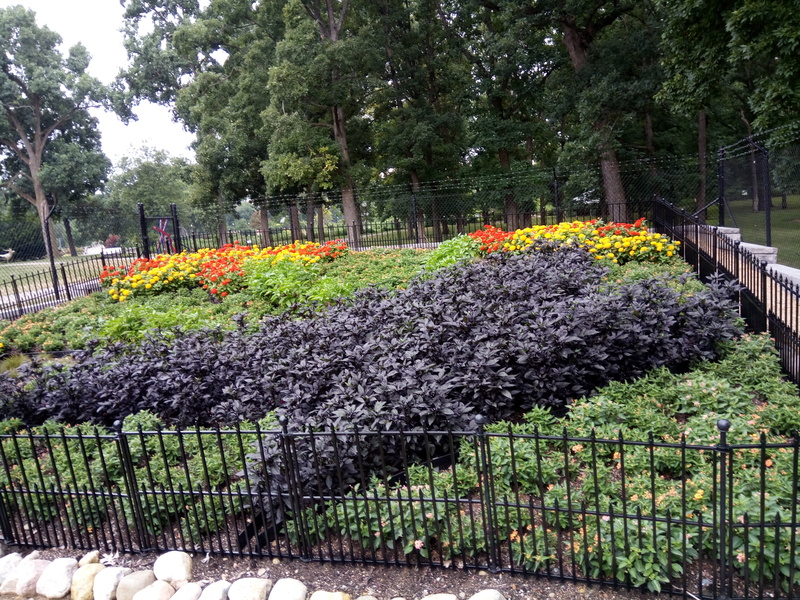 Ornamental peppers provide color for this quilt garden. 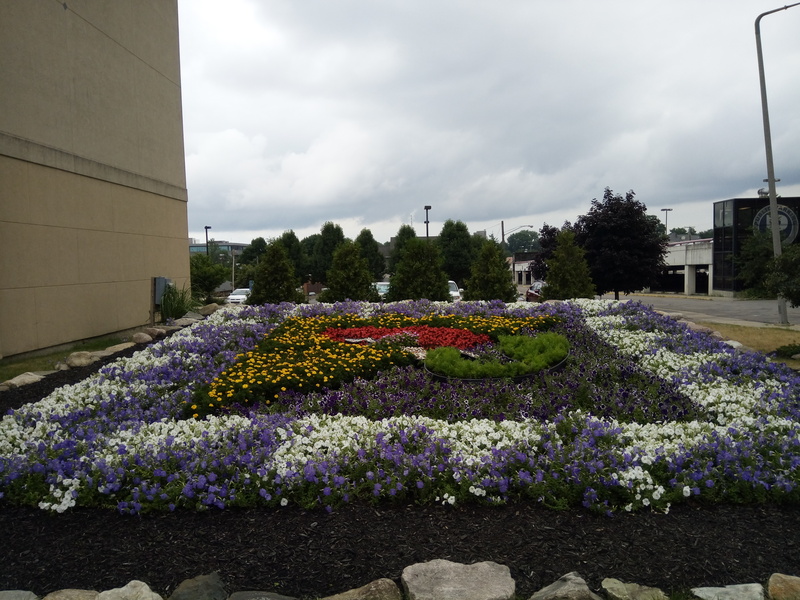 This space next to a building is transformed by this quilt garden. 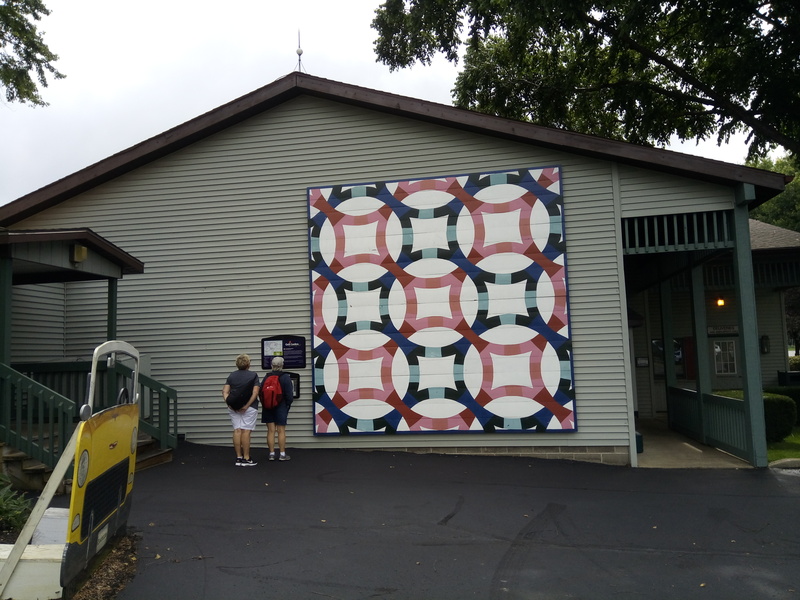 In addition to the gardens, twenty one large quilt pattern murals adorn assorted buildings along the tour. 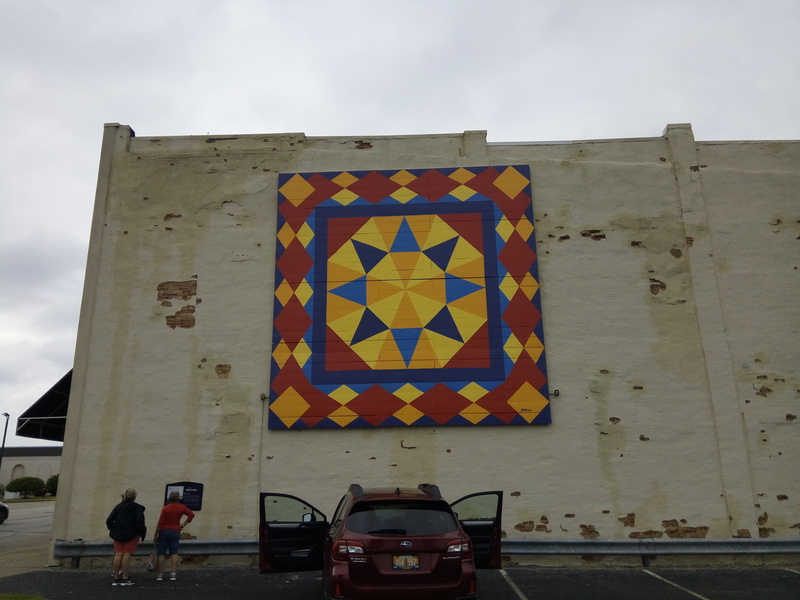 This large quilt mural dresses up an otherwise drab wall. Quilt makers will recognize the quilt patters. Unless you’re short on time, we suggest you plan on taking at least two days to enjoy the gardens and other attractions along the way. Last week I saw a lot of gardens having problems with tomato plants not producing fruit. When discussing this problem with gardeners, the first thing I hear from them is usually,” I’m growing lots of leaves but no tomatoes”. Then they go on to attribute it to an overabundance of fertilizer of one sort or another. Nutrient imbalance may cause problems, but this season it is likely due to the extended hot temperatures we had until the break in the weather happened this week. Temperatures in the mid-nineties can damage tomato blossom causing them to fall off the plant — no blossoms means no tomatoes. This phenomenon is known as “tomato blossom blast”. Heat damaged tomato blossoms turn brown. There is really nothing we can do to prevent flower damage when the temperatures are so high except wait it out. Now that the weather has moderated, our tomato plants will start producing more blossoms and setting more fruit. 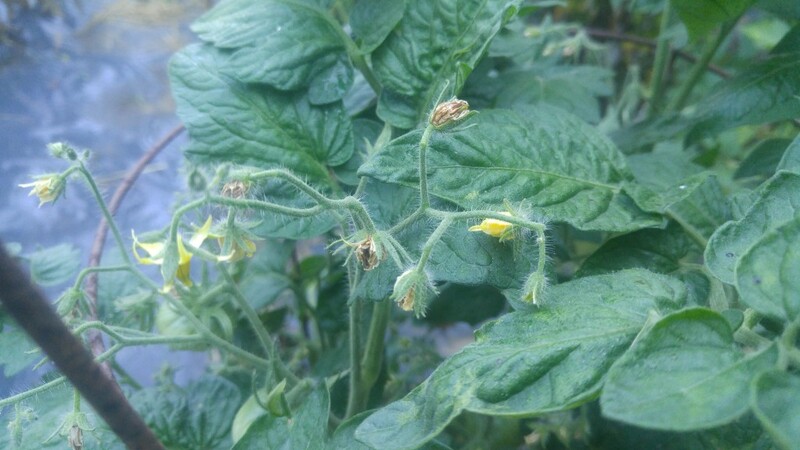 If another heat wave occurs, it’s likely we’ll see another round of tomato flower blast. By now, most people are aware of the declining honeybee population. What is not as well know is wild bees are having the same problems. Wild bees are important because in many instances they are more efficient at pollinating some crops than are honeybees. They are also highly adapted to pollinating wild flowering plants making them an essential part of our ecosystem. Some commercial beekeepers make a large part of their income by renting hives of honeybees to farmers who grow valuable food crops. Almonds are one example of a crop that requires honeybees to pollinate large plantations of trees. There are now a new breed of beekeepers who are commercially raising wild species such as alfalfa leaf cutter bees and renting them out to farmers. I guess in that case they’re not wild anymore. You can however become a beekeeper of sorts with very little effort. Instead of keeping honeybees, you can provide a home for wild bees. Most species of wild bees are solitary. They do not congregate together to form colonies like honeybees. They never will see their parents or siblings unlike honeybees who are surrounded by thousands of family member all pitching in to raise them. When an adult female solitary bee looks for a place to lay her eggs, she doesn’t look for a hive. Instead she looks for a sheltered spot where the egg will be safe while it is incubating on its own. This is most often a crack or fissure in a tree or even better, an opening made by some other animal such a a hole left behind from a tree boring insect. 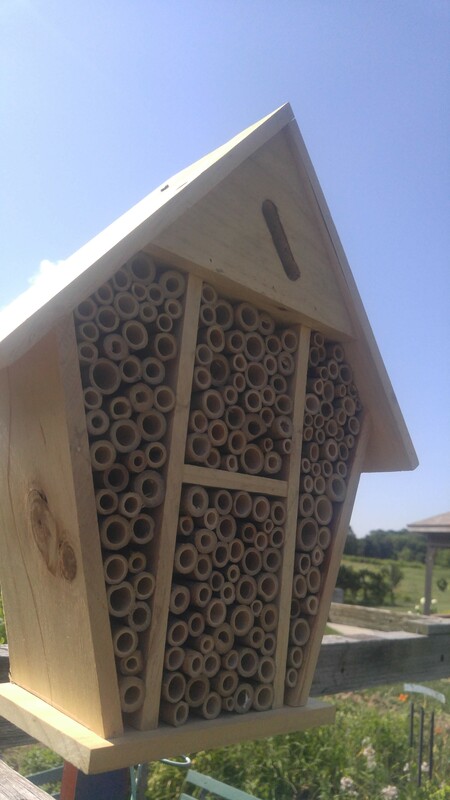 You can purchase pre-built bee houses like the one shown here. Or make your own, bees are not choosy. Small bee houses for these solitary bees are available to those who would like to help out our wild bees. These bee shelters come in an almost endless variety but they all have one design feature in common, holes that mimic natural cavities for female bees to lay their eggs. Some designs are not much more than simple blocks of wood with many holes drilled into them. Others use stacked up hollow stems of bamboo to form the shelters. Sometimes a roof is attached to keep the rain out. You can make your own or buy these bee houses at garden centers or online. Either way it is an easy way to become a beekeeper or at least a bee helper. Unfortunately, solitary bees don’t make honey, they have no reason to. On the other hand they don’t sting. Imagine self-propelled robotic lawn groomers, too sophisticated to be called merely lawn mowers, taking care of your lawn without any help from you. Miniature drones with intelligent eyesight hovering over your lawn identifying weeds insects and diseases, zapping them with pin-point precision accuracy. All this guided by on-board artificial intelligence leaving behind an absolutely flat, emerald green, expansive mono culture of grass that is your lawn. NOT! That vision of the the lawn of the future may soon be outdated and considered quaint and wasteful. There’s a grassroots movement beginning to grow in this country that has an entirely different view of what a lawn should be. Millennials and upcoming generations are abandoning old-fashioned lawn ideas for something quite different. Rather than boring grass (yawn), perennial broadleaf plants are replacing much of the grass in these new lawns. Growing together in pleasing patterns they form a natural tapestry kind of look. Broadleaf plants are quite variable in their growth habits, each one has a different texture, color or leaf pattern. Most will even flower for part of the season adding an extra element to the lawn tapestry. A mix of broad leaf plants is an attractive alternative to monotonous turf grass. In an ecosystem made up of dozens of species of plants, instead of one or two grasses, turf diseases, insects and other pests can’t even get a start much less spread. Legumes like white dutch clover fix nitrogen from the atmosphere then add it to the soil reducing or eliminating the need for added fertilizer. This type of lawn can be mowed much like grass to keep it looking neat. Most people cut their grass too short so typically, the height of the mower will need to be raised to allow more leaf area on the plants to keep them healthy and looking good. 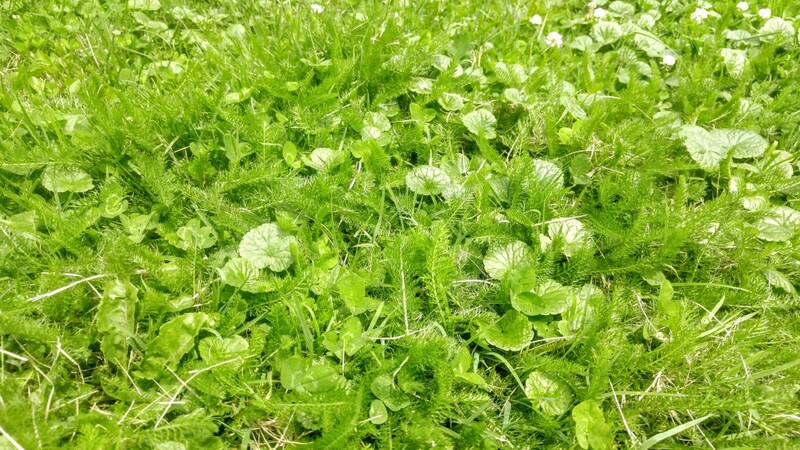 Weeds can still be a potential problem in this system however typical lawn herbicides can’t be used to control them. The very herbicides used by lawn companies are designed specifically to kill those kind of broadleafs that make up the new lawn. No more herbicides and no more fertilizer has the potential to upset the lawn care industry. On the other hand, the trend, over time, will probably move beyond a do-it-yourself project encouraging a new generation of entrepreneurs to develop a new industry installing and maintaining the new look. As an analogy, think of what micro-breweries are doing to the beer industry. In the meantime, you can start your own lawn mosaic. Start by eliminating the use of herbicides that kill lawn “weeds” — that includes so called “weed and feed” formulations. A wider variety of plants will be encouraged by improving the fertility of your soil. Try experimenting with different types of seeds to see how they grow in your lawn. There’s no need to feel sorry for the herbicide industry as they lose market share, there will always be people who will stubbornly hang on to the old ways of growing a lawn. Every once in a while we’ll be making something that calls for celery, like potato salad or chicken soup. I’ll check the fridge only to find out there’s no celery in the crisper drawer. Not to fear, there’s a perennial plant growing in the garden that’s always on stand by for such an eventuality — that plant is my cherished lovage. I’ve been growing lovage for many years, it such an easy plant to grow. And once it gets established, it seems to grow forever barring any drastic; like letting the chickens roam in the garden in early spring forgetting that the lovage was there. But I digress. It’s celery flavor is what I go for but it has other uses too, uses I’ve never tried. The herb is stronger tasting than celery but is much sweeter. All parts are edible. Homemakers in the past have used it’s seeds for flavoring breads, cakes and a whole lot of other foods. They’ve even added lovage leaves to cookie dough. A type of candy made from lovage was very popular at one time. The root is edible too. Want to impress your friends and go on more dates? 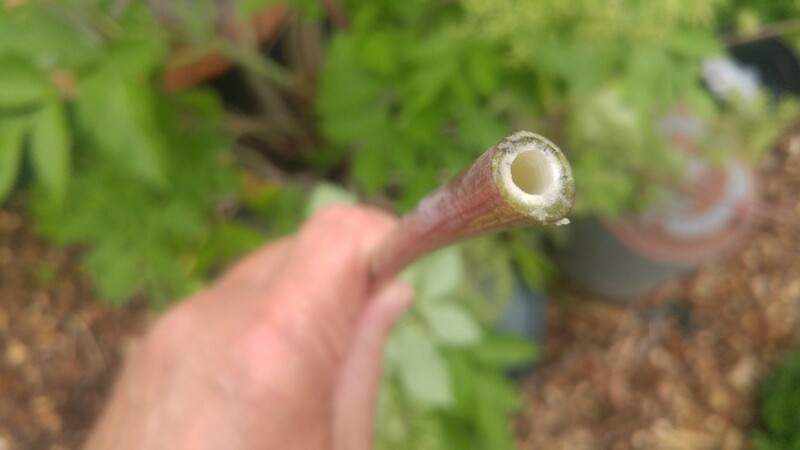 Lovage stems are hollow, use them instead of straws when serving Bloody Marys. My lovage is well over four feet tall and full of blossoms. It is really enjoying the regular rains we’ve been getting this spring. I have it growing in a sandy, well-drained area but my guess it will grow just about anywhere. Lovage also has medicinal value helping to ease digestive problems. You don’t hear much about lovage being used in the kitchen very often these days. Maybe back in the olden days it was grown a lot more because it has so many uses. Then as people became more prosperous they started using store-bought herbs and spices, that’s just a guess on my part. Chefs nowadays are always looking for that next big thing or that unique taste sensation that will bring them adulation from their patrons and admiration from their peers. I reckon lovage might be that flavor they’re looking for — it’s poised for a comeback in a big way. H-m-m, maybe I’ll start a lovage farm.